Mount Toubkal is a mountain peak in Morocco and is the highest peak in the High Atlas Mountains. High Atlas is the highest mountain range in North Africa and runs diagonally across Morocco, from the Atlantic coast northeast of Agadir all the way to northern Algeria. In Berber, it’s called Idraren Draren (Mountains of Mountains). There are several summits higher than 4000m in the range. The high Atlas mountain is one of the world’s great trekking ranges. Beauty and adventure, diversity and challenge are all to be found here. The route you choose, however, will depend upon some factors. These will include not only the season but also your level of fitness. You should even think carefully about your reasons for visiting the Atlas. If you wish to reach the roof of North Africa, make Mount Toubkal climb. Most high Atlas trekkers make Mount Toubkal (4167m/13,67 ft), the highest peak in the North of Africa, their first goal. Indeed, in the season about 90% of trekkers in the high Atlas Mountain are likely to be in the Toubkal region at any time. Mount Toubkal is accessible to reach from Marrakech and, it’s only two hours from Marrakech to Imlil village at the foot of Toubkal, the summit can be tackled in just a couple of days. Toubkal is a stark but exceptionally striking region. 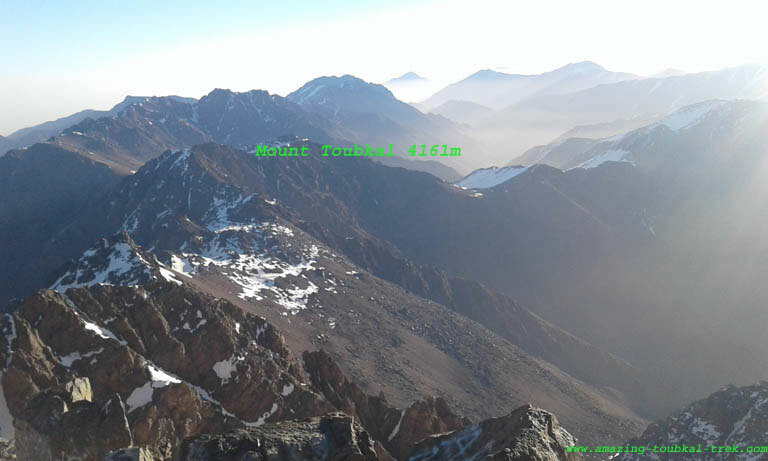 The views from the summit of Mount Toubkal provide an excellent opportunity to see the way in which the Atlas mountains form a spine across the length of Morocco, dividing a gleaming Atlantic coast to the north and west from the scorching vastness of Saharan Africa to the south and east.